Sitting in my office, yet another phone call about an aggressive Staffordshire Bull Terrier mix came through from Mr and Mrs Chalkwright. Like most ‘dog people’ Staffordshire Bull Terriers and types are cropping up more and more commonly in my working life. This wonderful breed is now becoming much maligned and filling up our rescue centres, being destroyed in numbers beyond all belief and being rehomed in similarly high numbers! The Pit Bull epidemic is off the scale in the UK. What do I mean by Pit Bull Epidemic? Staffordshire Bull Terrier crosses – crossed with Bull Dogs, American Bull Dogs, Dogue De Bordeaux, Boxers – anything to try to replicate the now banned Pit Bull Terrier. These dogs are being purposely bred, sold cheap to dishonourable, unknowing or naive people and subsequently ending up in trouble. Dave is one such dog, owned by the aforementioned Chalkwright family. Dave for whatever reason found himself in the care of the RSPCA. I could make numerous assumptions (which may be incorrect!) as to why he was there, but there he was – a dog amongst many others of his type with incorrect upbringing looking for a home with a caring family who could become his new carers. Quantity wise – there are so many Staffordshire type dogs to choose from, when one has a problem, they are likely to stay in rescue for either much longer, for life or to be euthanased. The RSPCA knew that Dave was aggressive with dogs and so made that clear to potential new adopters. Fortunately Mr and Mrs Chalkwright saw past his “rap sheet” and decided to take him anyway – with the proviso that he must always be muzzled in a public place. Rob and Caren Chalkwright could not resist Dave and took him home despite the issues. 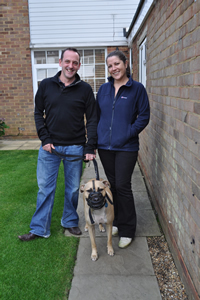 The aggression towards other dogs was something that they thought they could live with and manage and so Dave came home! Well, Dave is quite a large dog by most people’s standards and when Caren nearly got taken off of her feet when Dave tried to attack another dog, the couple felt like Dave should be returned to the RSPCA home. Fortunately, human nature took over and they became attached to Dave and felt some loyalty towards him and so sought advice to begin with helping ‘get Dave better’. So, on the internet they went – to find a local dog professional to help them. The first and the second trainer went to see Dave and the Chalkwrights and the upshot was that Dave was dangerous, must continue to be muzzled and his attitude will not get better. They have to lump it or like it. When I arrived, Dave came to greet me at the door and (as usual) I fell in love. A gorgeous dog, with a rubbish start awaiting help and thankfully – two caring owners who wanted to provide that help and had ignored previous advice that Dave was off the scale of rehabilitation. After a coffee and a chat for about half an hour about Dave and his history, I decided to see for myself the extent of Dave’s issues relating to other dogs. Caren explained to me that she had a fear of ‘Alsatians’ – so there it was – she could be my stooge dog handler (with my GSD’s AKA – Alsatians)! Two birds with one stone and all! I went off to the car and got Bill, my little Pomeranian from and waited for Caren and Rob to bring Dave out. Dave was on a harness and muzzle. I walked around the corner with Bill and there was Rob, a nervous Caren and a bonkers Dave. I was not quite expecting the level of aggression that I saw with Dave. As soon as I came in to view; he went berserk and clearly Rob was finding it difficult to hold/manage him as Dave catapulted forwards aggressively time and again. I went back to the car – telling Caren to follow me. I gave her Bill to hold and gave her Vhko – a GSD. Her face went white, but time was pressing and so she got on with the job at hand – my dog handler. That meant that I could handle Dave and get more proximity to my dogs. Within five minutes, or less, Dave was sniffing Vhko and Bill through the muzzle without attacking them. He quickly got the idea that they were no threat and that I was in charge. We walked for about 10 minutes and I asked if it would be OK to take Vhko and Bill into their home and garden. Obligingly, they agreed. So after that, I lead the way with Vhko and Bill into their home and through to the garden, followed by Dave. Then we released them from their leads. Dave was fearful, but coped well with his house guests. I imparted my advice for the day to the (shocked) Chalkwrights and agreed to meet them again in a couple of weeks. My advice entailed some leadership in the home, walking in more dog populated areas and some obedience training. 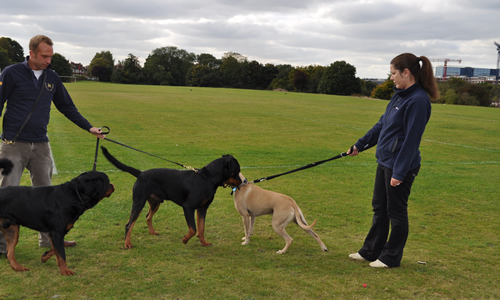 I got regular emails about them meeting other dogs and all was going well with Dave muzzled and on lead. I then went to see them again with Bill, Vhko and my two Rottweilers, Utz and Rohkh. 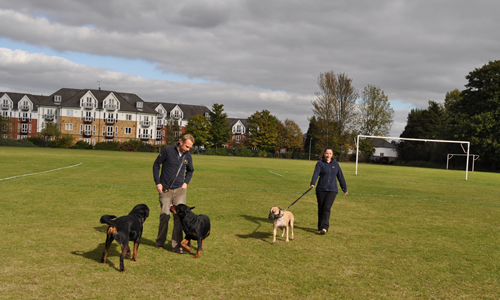 I was pleased with their progress – they had been out meeting dogs each day as I had asked and been making all of the routine (and food) changes to Dave’s lifestyle. I went in to the house and had a chat with them about their progress, what they had been doing and their thoughts. They were ideal clients – doing most of what I had asked them to do and so reaping the benefits. So, to assess their efforts we headed off to the park. Firstly, we introduced Dave yet again to Bill and Vhko – Dave was a model dog and enjoyed his interaction with them and was much more confident in their presence. Rob and Caren were still a little anxious about meeting little dogs and so they were pleased with his behaviour with Bill. Bill is one of my most regular stooge dogs – she is an expert in canine body language and tells me very quickly if she is at all concerned about a dog she meets – with Dave, she was totally confident and relaxed and I knew we had nothing to fear. We then removed the muzzle and went for a walk, off lead with Dave on a flexi-lead. The next phase was to meet the two entire male Rottweilers. We placed the muzzle back on Dave initially and because Caren was still fearful of meeting dogs with Dave, Rob stayed away and Caren ‘met’ me and the Rottweilers in the middle of the park. Again, Dave coped well. He was fearful, but thanks to the approach of Utz and Rohkh, he quickly gained confidence in his safety and engaged well. 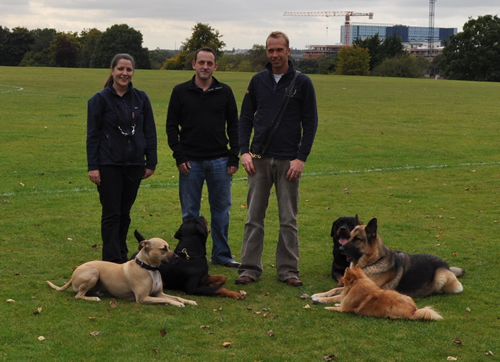 Then, we removed the muzzle and walked with all five dogs around the park. Working on, Carens fear of German Shepherds and Dave’s fear of all dogs! Why was Dave so aggressive to dogs? Because he was fearful and received the worst upbringing (no fault of the Chalkwrights) with a total lack of socialisation. What did the previous trainers think he was beyond that pale? I have no idea except to say that thy clearly did not know a great deal about dogs, how they learn and what motivates change in psychology. Whilst under the guise of “kind and effective”, these trainers were both unkind and ineffective – subjecting Dave to a life of lead walks at best and at worst – he would be returned to the RSPCA kennels where onward rehoming would be most unlikely. Thankfully, Caren and Rob did not give up on Dave. They have worked very hard to ensure that he continues to improve with his general behaviour and with meeting other dogs. I am very pleased for Caren and Rob that they no longer have the embarrassment of Dave’s aggression, but most of all I am pleased for Dave that he can have a life of engagement and interaction with others of his own species. © Copyright 2013 by Ross McCarthy. All Rights Reserved.